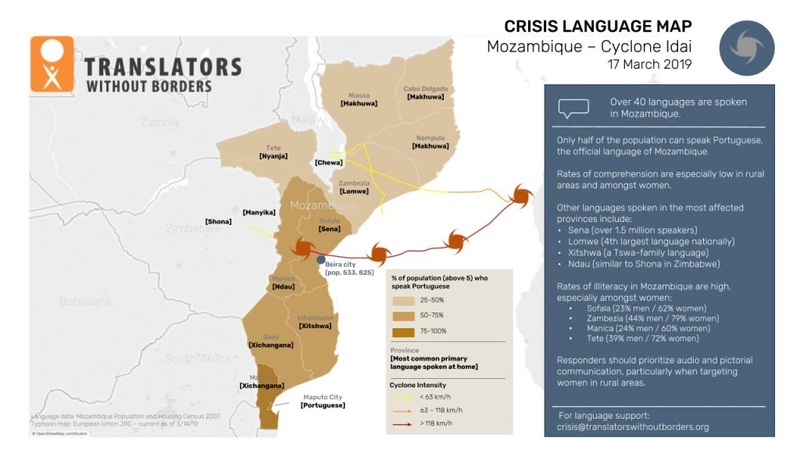 Cyclone Idai’s intense winds and heavy rains have been causing death and destruction in Malawi, Mozambique, South Africa, and Zimbabwe since 6 March 2019. As of 18 March, 2019, an estimated 1.5 million people have been affected across the four countries. Hundreds of thousands are in need of critical emergency communication in a language and format they understand. Over 40 languages are spoken in Mozambique alone. Only half the population can speak Portuguese, the official language. Portuguese comprehension rates are particularly low in rural areas and among women. Other languages spoken in the most affected areas include Sena, Lomwe, Xitshwa, and Ndau. People in the affected districts of Malawi mainly speak Chewa and Lomwe, and Yao in the northern part of the affected area. In the hardest hit districts in Zimbabwe, Chimanimani and Chipinge, Ndau and Shona are the main languages spoken and understood. To alleviate suffering and contribute to rapid recovery, it is important to get life-saving information to communities quickly, in the languages of those affected. To ensure understanding among less educated individuals and second-language speakers, communication should be short, simple, and clearly illustrated. Important information should be provided in plain language, absent of jargon, and with pictures when possible. To learn more about Translators without Borders’ work in crisis response, and to get support for your program, email us: crisis@translatorswithoutborders.org.